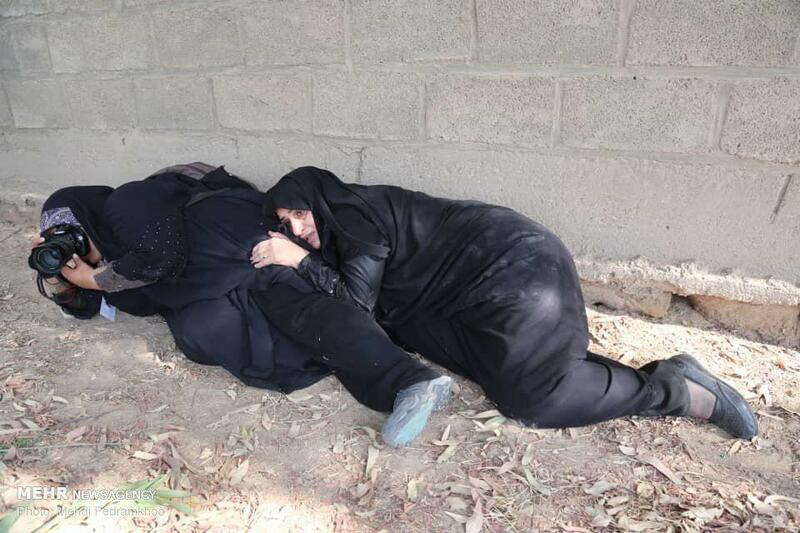 A photographer who took memorable pictures of the recent deadly terrorist attack on a military parade in Iran’s Ahvaz has recounted the tragedy and explained the mood on the ground at the time of the incident. Five terrorists attacked a military parade of the Iranian Armed Forces in the southwestern city of Ahvaz on September 22, 2018, killing 24 people and wounding 68 others. In the very early hours of the tragedy, photos of the incident were posted on social media. A few specific photos went viral. One of the pictures shows a woman photographer lying on the ground and taking photos and another lady taking shelter by her side. 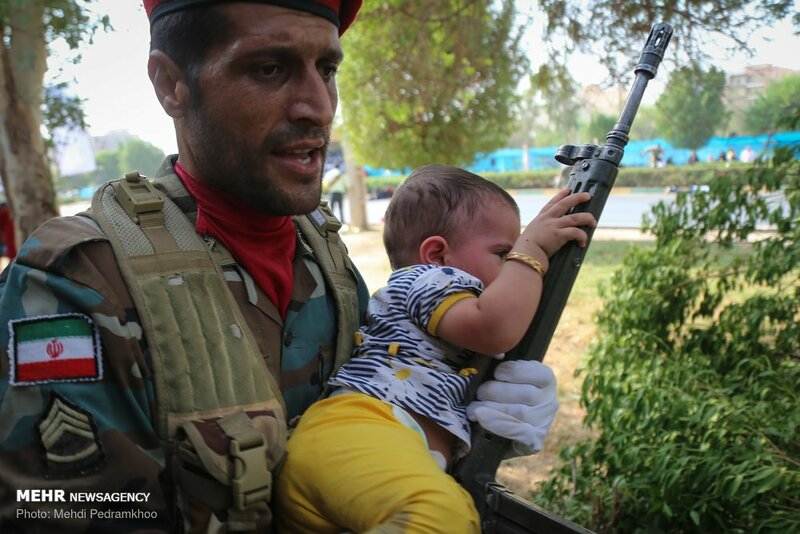 Another photo shows an Army commando holding a young baby in his arms and taking him away from the scene of the attack. The kid has clutched the commando’s gun and seems worried. The Sobh-e Now daily has held an interview with Mehdi Pedramkhoo, the photographer who captured those moments in photos. He has talked about the ambience at the moment of the attack and the tense conditions under which he took the photos. Mr Pedramkhoo, you were among the first photographers to capture images of the terrorist attack, which were posted on social media. How come you were chosen to take photos of the ceremony? The Mehr News Agency had made arrangements the day before the parade for me to be present at the ceremony. The next morning, I went to the special place allocated to journalists at the ceremony. The ceremony began at 8:30 local time, and the terrorists struck at 9:00. As in previous years, there were troops on the ground that fired blanks in a ceremonial show as part of the ceremony. First, we thought it was the sound of blanks being fired. But when bodyguards stood by the dignitaries at the ceremony, we found out that something was going on. How far away were you from the scene of the shooting? The shooting took place from behind the podium. The terrorists struck from the park. After they opened fire, an order was issued to the people and troops there to take shelter. Then people rushed to take refuge and get away from the scene. Immediately, the gate of the adjacent garrison was opened and the people went in. Unfortunately, some of them were killed or wounded. I think the most usual reaction was to run, but you didn’t run away and kept taking photos of the incident instead, right? I think I had an adrenaline rush. I took my camera quickly and took pictures of the people who were running away. A military police soldier standing next to me was shot in the arm. Then I took photos of him. Were you that close to the scene? It really happened all of a sudden. It was crowded. The ones holding guns took shelter by the streets because their rifles were not loaded. As a norm, guns are not loaded during parades. First, I thought the soldier next to me had taken shelter there, but later I saw he had been shot. I saw some photos that you had taken of a lady taking pictures while another woman has taken shelter behind her. Right? She is Ms Fatemeh Rahimavian, the photographer of Fars News Agency. When the shooting began, they opened the gate of one of the garrisons, so that people would be able to take refuge there. I was close to the scene and saw that this lady photographer took shelter by lying down. Then I took a photo of her, and I think it turned out to be a good picture. You were right there at the scene where you had to protect your life on the one hand and take photos on the other! When it all began, I had a feeling of fear. But I was taking photos at the same time. On the parade ground, I took shelter next to the forces of the IRGC (Iran’s Islamic Revolution Guards Corps) and kept taking photos. But when I was alone, I lied down to dodge the bullets.